There are elections for councillors on 22 local councils in the Anglia region on Thursday 5 May along with new Police & Crime Commissioners. The final result of the local elections in the Anglia region has seen a small cut in the Conservative majority on Epping Forest Council in Essex. Although voters went to the polls on Thursday, the votes in Epping Forest were only counted on Saturday morning. The Conservatives made a net loss of two seat cutting their overall majority to 14. There were gains for the Green Party and a local residents group. Epping Forest has had a Tory majority since 2007 although before that it was a hung council for many years. All parties ending up claiming some measure of victory in the local council elections in the Anglia region. The Conservatives won the most seats overall and won back at outright working majority on Peterborough City Council. But the party also lost the most seats in the Anglia region - down 16 overall. Labour, UKIP and the Liberal Democrats all made gains while the Greens made losses overall. Here is a round-up of the local election action from across the Anglia region. Matthew Hudson has been looking at the west of the patch. While Kate Prout has at look at what happened in the East. All the political parties are claiming some measure of success in the local council elections in the Anglia region. The Conservatives have lost councillors but scored a major victory by winning back an overall majority on Peterborough City Council. It brought the Prime Minister David Cameron into the city to celebrate with party workers. There were gains in the region for Labour, the Liberal Democrats and UKIP while the Greens made losses. Conservatives remain in overall control despite losses. Credit: ITV News Anglia. Labour has lost all its seats on Rochford council as the Tories held onto overall control. But it was not all good news for the Conservatives, who lost six councillors taking their majority down to three. UKIP, Liberal Democrats, the Green Party and the independent candidates all benefited from Labour and the Tories' losses. The Conservatives have held North Hertfordshire council. Credit: ITV News Anglia. Labour and the Liberal Democrats both made gains in North Hertfordshire - but not enough to take overall control of the council away from the Tories. The Conservatives still have a sizeable majority of 19 councillors. The local authority has been in the hands of the Tories since 1999 when it took over from Labour. 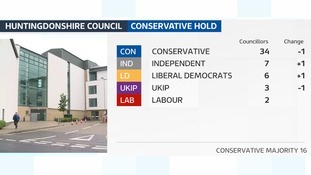 The Conservatives have held South Cambridgeshire council. Credit: ITV News Anglia. The Conservatives still have an overall majority on South Cambridgeshire District Council despite slight losses in yesterday's poll. The Tories and independent candidates lost out in favour of the Liberal Democrats. But the Conservatives still have a majority of 15 over the other parties. The Conservatives have held onto their overall majority on Welwyn Hatfield Borough Council despite losing seats to Labour and the Liberal Democrats. Boundary changes mean an all-out election, but the number of councillors remains the same. The Tories have held power in Welwyn since 2002. The party now has a majority of 8 over the other parties.